eriods of severe stress can do all sorts of strange things to crops. 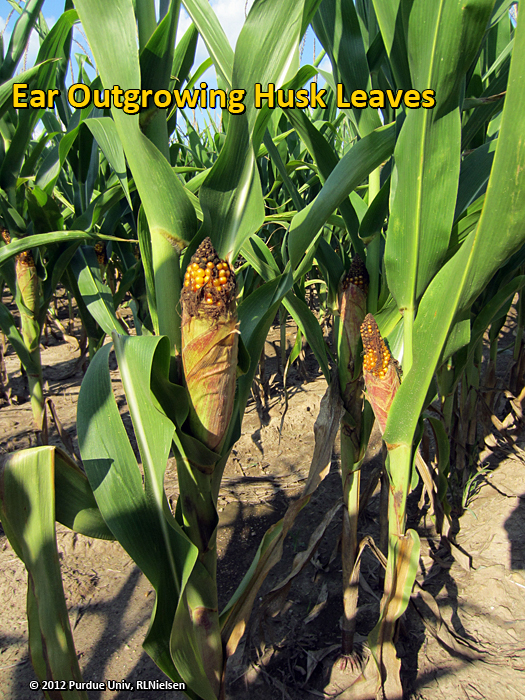 One oddity that has been reported by a number of folks this year is often described as "ears outgrowing their husks." The phenomenon is the result of stunted husk leaf development combined with fairly normal ear (cob) elongation. 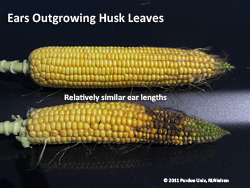 The primary symptom is that the ears elongate beyond the end of the stunted husk leaves, resulting in exposed kernels that are subject to insects, birds, and weathering effects. Kernels damaged by these factors are vulnerable to fungal infection and the development of ear molds. Consequently, overall grain quality can be compromised to the point that grain buyers may discount or "dock" their prices accordingly. The development of stunted husk leaves and exposed ears seems to be related to combination of severe stress before or during pollination that is then relieved in the initial weeks following pollination. The most common combination of conditions that results in this oddity is severe heat and drought stress that is then relieved by cooler temperatures and rainfall. The stunting of the husk leaves is similar to what happens to the whole plant when it is subjected to lengthy periods of heat and drought stress. The potential for husk leaf expansion and elongation seems to be permanently restricted while the ear (cob) is able to continue elongation upon relief of the stress. 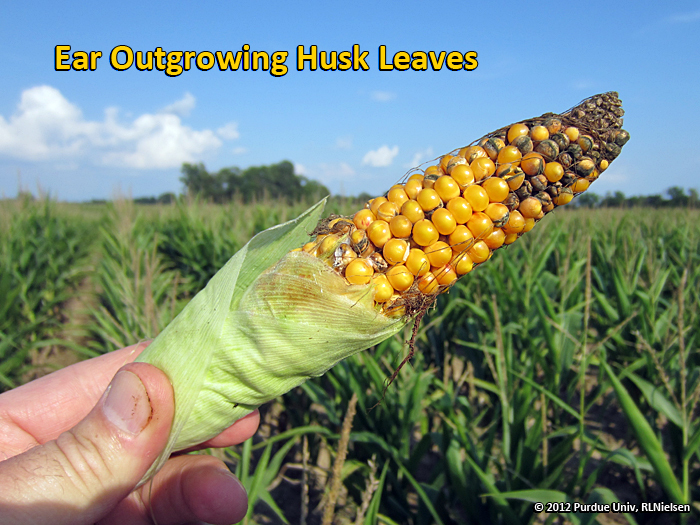 While the combination of excessive heat and drought stress followed by relief due to cooler temperatures or rainfall seems to be the common thread among reports of ears outgrowing their husk leaves, other combinations of severe pre-tassel stress followed by relief of the stress by pollination time may also result in the stunting of husk leaves without stunting of cob length. 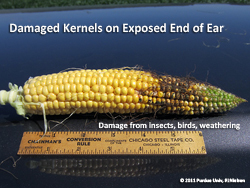 If not drought stress, it can be difficult identifying the nature of the pre-tassel stress. 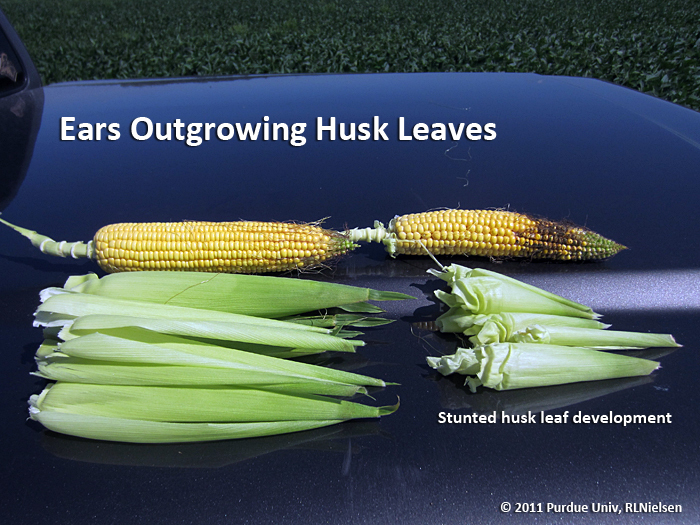 The photos to the right illustrate an example of stunted husk leaves from an area of a field in eastern Indiana in 2011 that was particularly drought-stricken compared to other, less stressed areas of the field. This field had also experienced severe root lodging about 10 days prior to pollination, which likely added additional stress on the developing ears for a period of time. 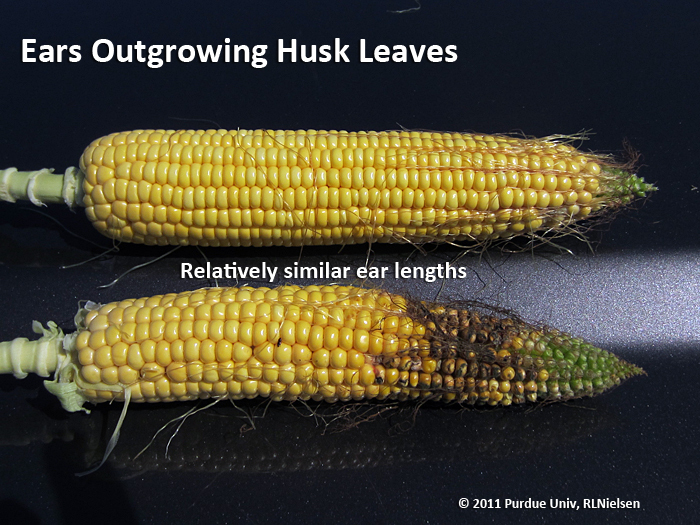 Husk leaves of affected plants were about 2/3 the length of the ear itself and about half that of the husk leaves of the "normal" ears. Ear (cob) lengths of the "normal" and "stressed" ears were relatively similar; though kernel number and size were smaller on the "stressed" ears. 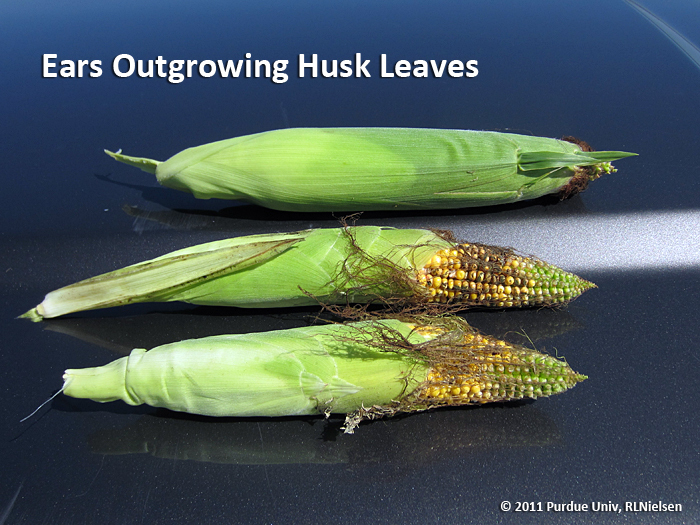 The ears below are from a field in northeast Indiana that experienced severe drought in 2012 that stunted husk leaves and cob length, but late rains were sufficient to allow the stunted ears to still elongate beyond the even more stunted husk leaves. In that situation, the drought stress was so prolonged and severe during the vegetative period that the height and overall size of the entire plant was significantly stunted. In 2018, there have been a few reports of short husks and exposed ears with no identifiable severe pre-tassel stress. Additionally, the plants with the affected ears are reportedly otherwise normal in appearance. This is indeed curious and I cannot come up with a good explanation. Nutrient deficiency or toxicity are not known to cause these symptoms. I am not aware of any herbicide injury that results in these symptoms.